We want you to be happy with your converted electric bike and to use it gladly and often. This is why we only sell high-quality technical products and work everyday to offer you first-class service. Electric Bike Solutions GmbH is one of the leading suppliers of conversion kits and batteries for electric bicycles. In the future-oriented electric mobility market Ebike Solutions excels by an especially innovative business idea: We convert your bike into an electric bike. Thereby you can keep your trusted bike, save the money for buying a new one and you contribute in a sustainable use of our environment's resources. The company was founded in 2009 by Thilo Gauch and Philipp Walczak, who in the beginning also were the only employees. Today the company has become a small-sized business with 17 employees. The team is made up from specialists for bike mechanics and motor technology, bike sales, electrical engineering and battery design, business economics and communications. Replacement and repair of own or third-party produced batteries. Also, we can look back on a vast number of successful special-purpose projects and prototypes. Our e-drives have already been used through the Russian Taiga and the Australian Outback. Of course we ourselves are on the go the electric way and use our bikes as technology test beds. By constantly testing we can offer conversion kits that are perfectly tailored to your needs. During a year abroad in San Francisco in 2009, prospective chemist Philipp Walczak constructed his first electric bike. He recreated a Dahon folding bike with a wheel hub motor from a Canadian pioneer company in the electric bike industry. This motor was powerful enough to conquer any gradient silently, emission-free and, above all, effortlessly. Inspired by the design of the Tesla Roadster, also developed in California, he created the battery himself from lithium-ion cells, as they are used in laptops. Today, these energy storage devices have gained acceptance in electric vehicles due to their high energy density. Back in Germany, business economist Thilo Gauch took a test drive. His enthusiasm for silent acceleration gave rise to the common business idea: ready-to-use conversions consisting of motor, battery and accessories should enable every customer to convert his bicycle into an electric bicycle. 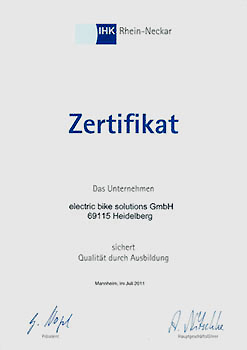 Following the development of a viable business concept, Electric Bike Solutions GmbH (EBS) was founded in Heidelberg on June 22, 2009. Order processing and shipping were initially carried out in a garage. In September 2010 the company moved into a 180sqm workshop with storage space and Büropl;tzen. Since July 2014, the Ebike Solutions office has been located at Carl-Bosch-Strasse 2. There, the team looks after customers on site, by telephone and via the Internet. In addition to the workshop and warehouse, the spacious hall also houses the showroom for the exhibited bicycles. As a commercial enterprise, we are aware of our social responsibility and have been one of the training companies since 2012. We've been getting a kick out of that load carrier for a while now. Our first load bike was a Yuba Mundo, with which we have been doing our shopping since 2012 and astonishing the Heidelbergers. By mid-2013, the market and the company had developed to such an extent that the professional distribution of loads became a serious option. After long research, extensive test drives and a lot of development work, we are now in a position to offer some of the world's best freighters. In our showroom there are various transport vehicles available for a test drive. In our two online shops e-lastenrad.de and yubaeurope.com you can inform yourself on the subject of cargo bicycles and find a large selection of two- and three-wheeled family bicycles and transport bicycles.